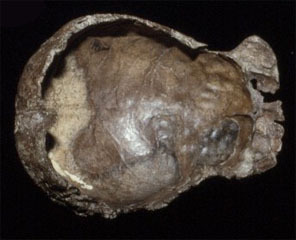 Trinil is the type site of Pithecanthropus (now Homo erectus) and the best known of all of the Indonesian hominin localities. Between 1891-1894 the Dutch anatomist Eugene Dubois excavated on the banks of the Solo River, close to the village of Trinil. After Dubois returned to the Netherlands, the excavation’s were continued by his assistants until 1900. Hundreds of vertebrate fossils were recovered and these were housed in the Rijksmuseum van Natuurlijke Historie, Leiden, the Netherlands, and are known as the Trinil H.K. Fauna. Recent palaeoenvironmental reconstruction from these fauna concluded that the site contained a mix of open savannah, densely covered river valley and upland forest species. 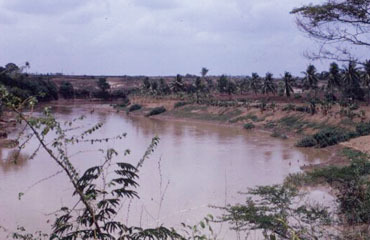 As the river deposits may contain water-born bones from a wide catchment, it is not certain to what extent the environmental reconstruction pertains to the area adjacent to where the hominin fossils were excavated. 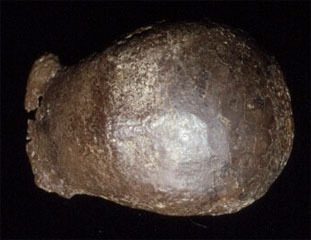 Trinil 3 femur with pathology on the shaft below the femur neck. This irregular calcification (myositis ossificans) is probably due to the formation of woven bone within a traumaticaly induced haematoma in the adductor muscle. Joordens, J., et al., 2015. 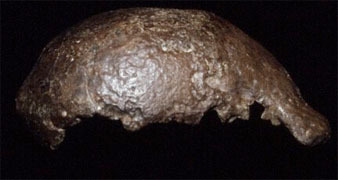 Homo erectus at Trinil on Java used shells for tool production and engraving. Nature 518: 228-231. Day, M.H., Molleson, T.H., 1973. The Trinil femora, in: Day, M.H. (Ed. ), Human evolution. Francis, London, pp. 127-154. Dubois, E., 1894. Pithecanthropus erectus, eine Menschenaehnliche Ubergangsform aus Java. Landersdrucherei, Batavia. Dubois, E., 1924. On the principal characters of the cranium and the brain, the mandible and the teeth of Pithecanthropus erectus. Koninklijke Akademie van Wetenschappen te Amsterdam 27, 265-278. Dubois, E., 1926. On the principal characters of the femur of Pithecanthropus. Proceedings of the Royal Academy Amsterdam 29, 730-743. Kennedy, G.E., 1983. Some aspects of femoral morphology in Homo erectus. 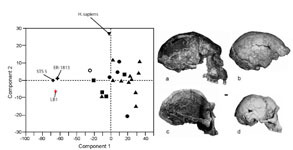 Journal Human Evolution 12, 587-616. Weinand, D.C., 2006. A reevaluation of the paleoenvironmental reconstructions associated with Homo erectus from Java, Indonesia, based on the functional morphology of fossil bovid astragali. Ph.D. thesis,The University of Tennessee, p. 256.